Following a brief summer pause, the CFC Foundation is pleased to resume its highly popular Evening Speaker Series for 2017! Leading-off an exciting Fall programme will be a unique and powerful look at military command and leadership during war, delivered in a manner that is sure to seize your interest. Join us on Tuesday, 12 September, for an exclusive engagement with celebrated Canadian war artist, Ms. Gertrude Kearns, and a personal introduction to her masterful commentary The Art of Command. Opening to great acclaim in Toronto in 2015 and again in Calgary during the past year, this inspired portrait and poster exhibit is only recently installed at the Canadian Forces College. Here’s a background article by Gertrude Kearns about her exhibit: Dropping Question Marks: War Art, Leadership, the Canadian Forces and Afghanistan. 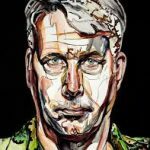 As an accredited war artist, Ms. Kearns has documented our Armed Forces from the Gulf War to the present. Afford yourself this rare opportunity as she provides you an introspective lens through which to view Canada’s war in Afghanistan as witnessed by many of those military leaders charged with waging it. Ms. Kearns introductory talk and a guided exhibit tour will be followed by a Fall welcome reception at the garden terrace of the historic Armour Heights Officer’s Mess on the College grounds. Last word – Reserve the Date; Wednesday 11 October, and join fellow Foundation Members and Friends, along with the Honourable Peter MacKay, PC, QC, for the annual Strathrobyn Dinner and an informed look at the critical, currently evolving Canada/US economic and security relationship. Your invitation to this premier Foundation evening will arrive in the coming days – so action accordingly!